Hi everyone! 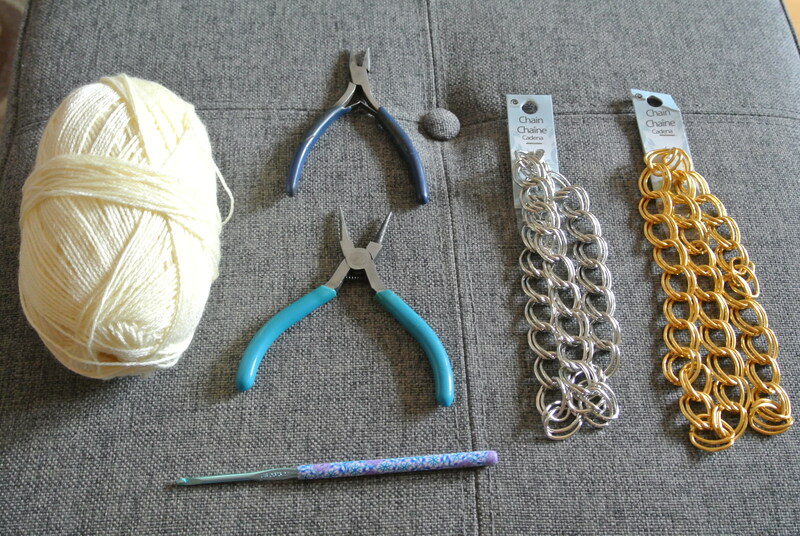 There was a great response to my post yesterday so I put together a tutorial so you can all make your own crocheted chain jewellery. Please note that it might not be possible for you to get the exact chain that I used so you may need to improvise a little bit. 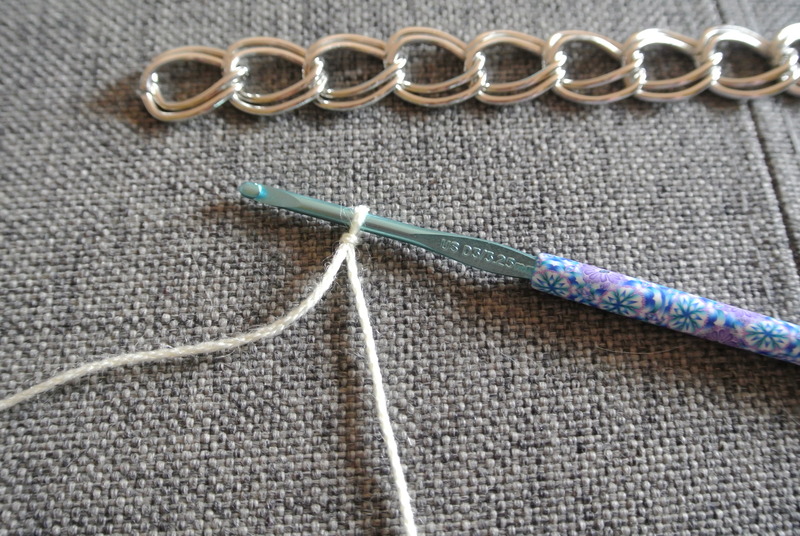 Consider this more of a guideline or “tips and tricks” for making a necklace. I got my chain at Walmart but some bead stores have spools of it and you can buy as much or as little as you’d like. 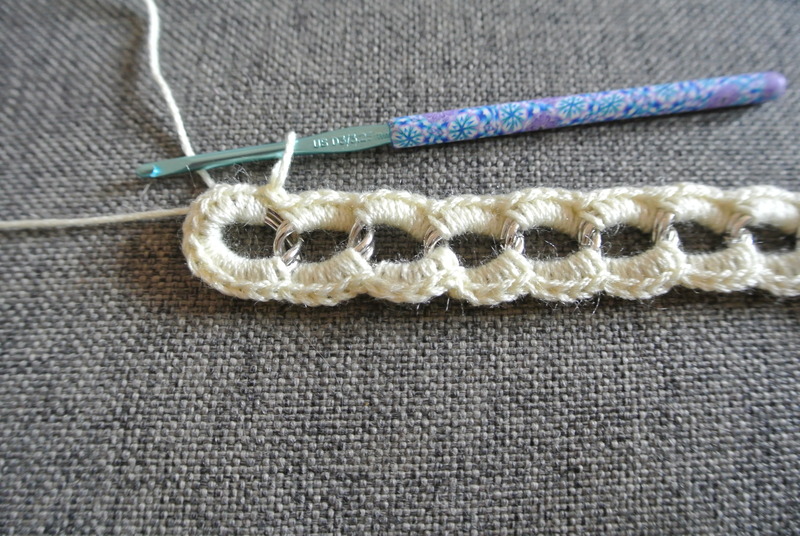 I used a curb chain for this project, if you look in the first photo, you’ll see that the links are shaped in such a way that the chain lays flat and it makes it easy to crochet around the outside edge. Two pairs of pliers to open jump rings/shorten your chain if needed. It doesn’t REALLY matter what kind of pliers, I just used whatever I had. Chain. These chains came pre-cut in 20″ lengths. 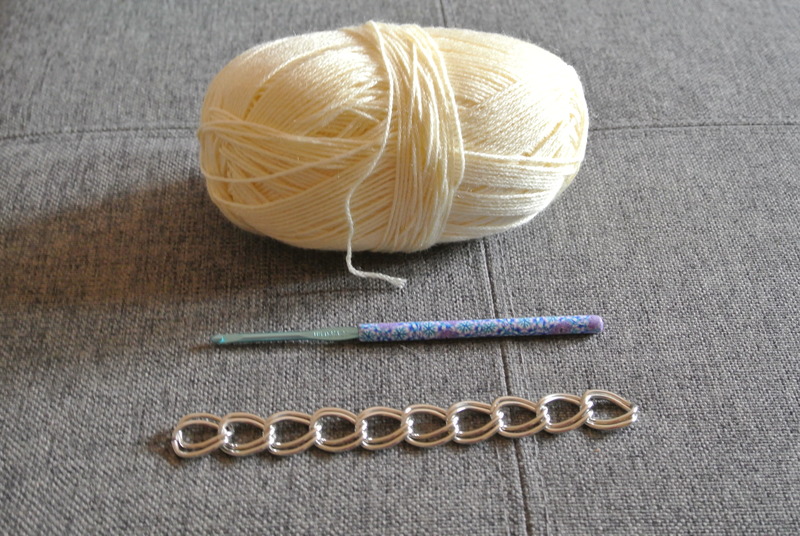 You can shorten your chain to make a shorter chain or a bracelet (like I’ve done in this tutorial). Crochet hook- I used a D/3.25mm hook, it’s just a touch smaller than the one recommended for the yarn I used. You’ll also need a clasp of some sort. 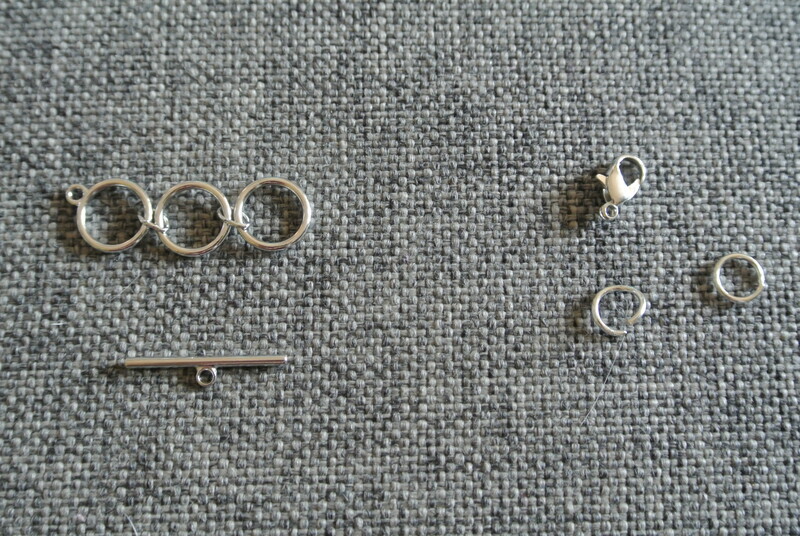 Personally, I prefer toggles (left), they’re easier to use, especially if you’re making a bracelet. I also used the jump rings pictured as well as one more that isn’t pictured. Also not pictured: yarn needle and scissors. 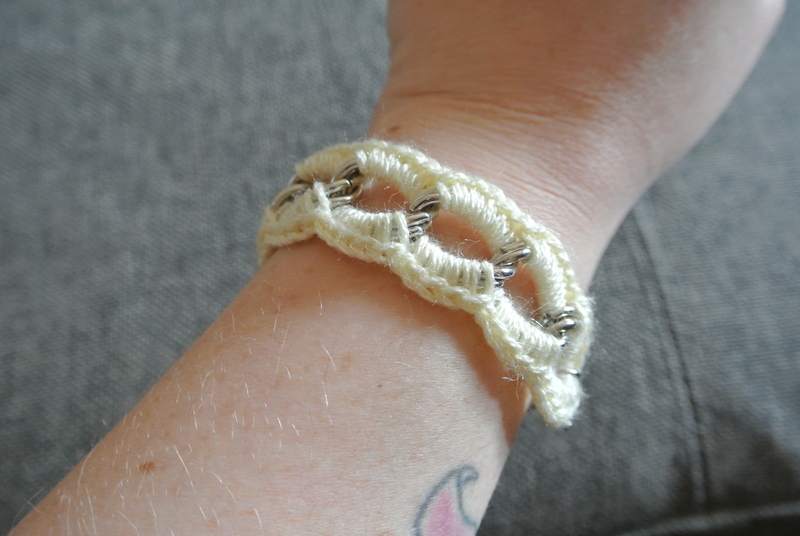 I decided to make myself a bracelet this time around. If you want your necklace/bracelet to be a certain length, make sure you take into account the fact that you’re going to put a clasp on it and make the chain a little bit shorter. Otherwise, you’ll end up with a finished piece that is a little bit longer than you expected. 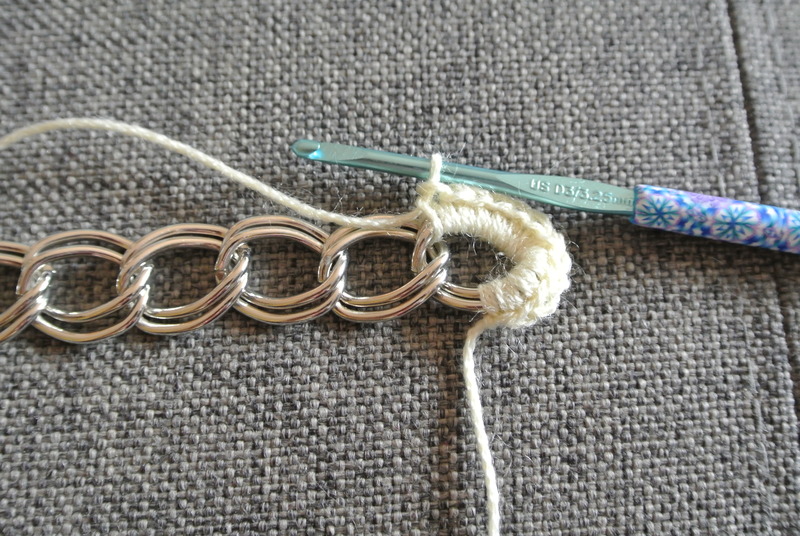 For this bracelet, I started with a chain that was about 6″. 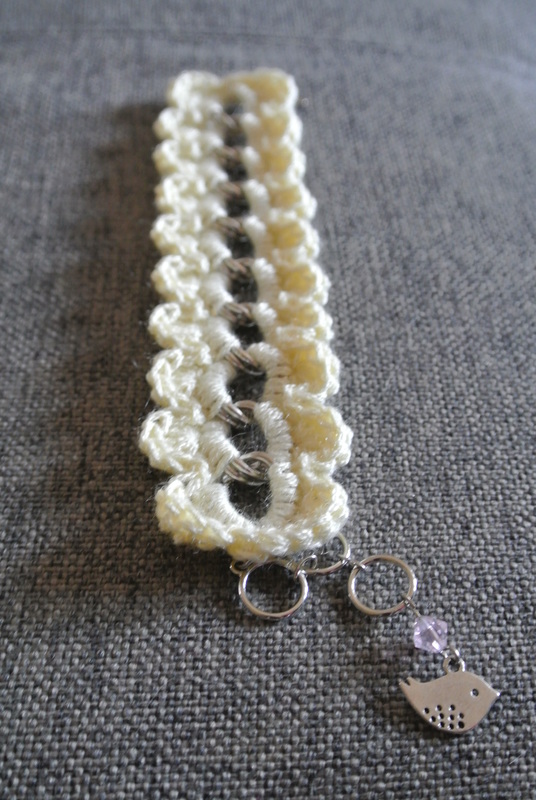 Once your chain is the length you want it, you can start to crochet! Put a slip knot on your hook. You’ll join with a single crochet in the link at the end. Here’s where the “guideline” thing I mentioned before comes in. 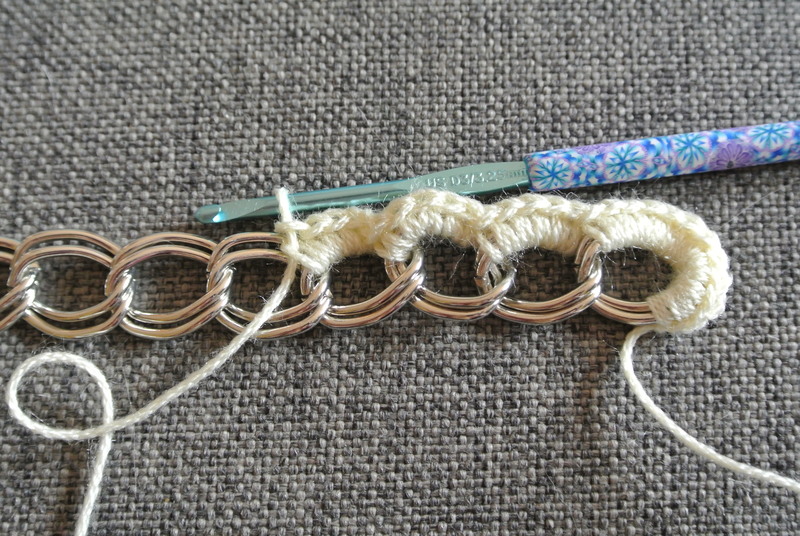 The number of sc stitches you work in each link will depend on the size of the links and the weight of the yarn you’re using. If you work too few or too many sc in each link, it won’t lay properly. Experiment a little bit. I worked 14 sc in the first link. Continue into the second link. I worked 5 sc into each link along the side. It might feel a little awkward to hold on to the chain but you’ll get used to it. It helped me to hold on to the link I was working in instead of trying to hold on to the whole chain. 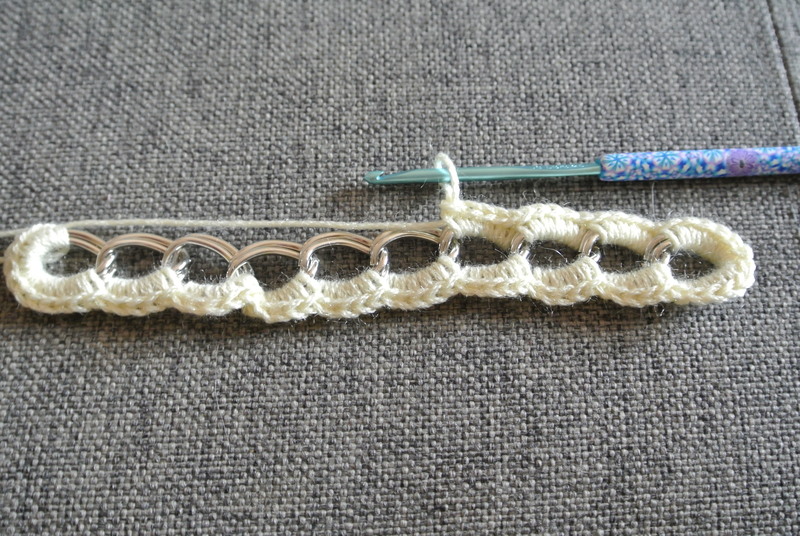 When you reach the link at the end, work the same number of sc as you did in the first link and continue crocheting along the other side. When you reach the point at which you started, slip stitch into the first st made. Weave in the ends. 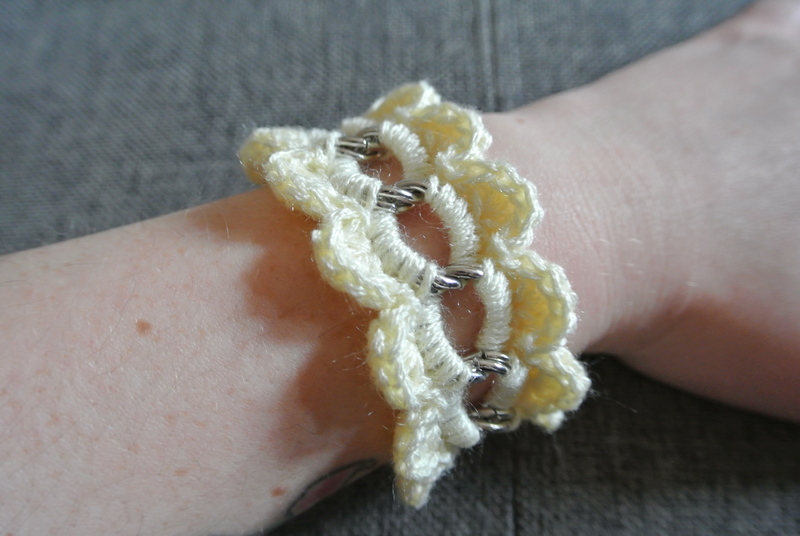 When I attached the clasp, I put the jump rings through the chain instead of just through the crochet stitches. This makes it more sturdy. If you used a lobster clasp, you can add an extender chain if you’d like. This makes it nice if you’re giving the bracelet as a gift and you don’t know what size wrist your gift recipient has. 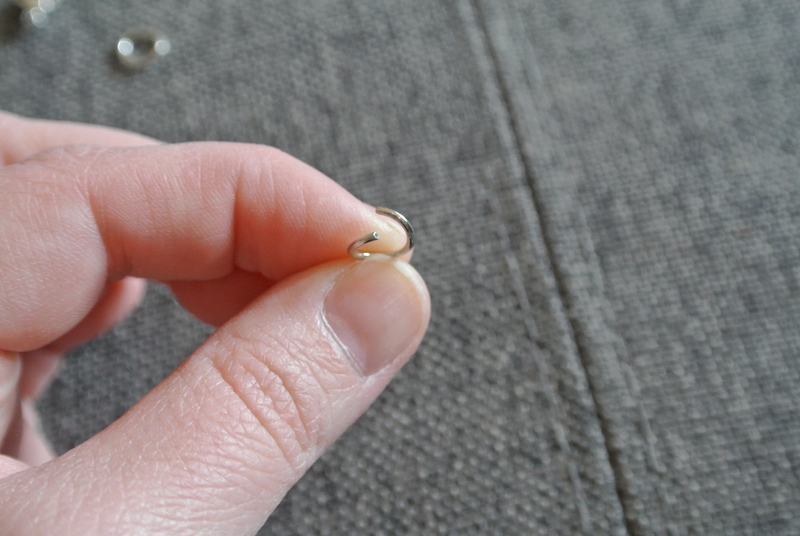 Because there were 5 stitches in each link, I worked a 7-DC shell into the middle stitch in each link. Get creative, what designs can you come up with? That’s it! These work up really quickly and look beautiful. Keep a few on hand for quick gifts!